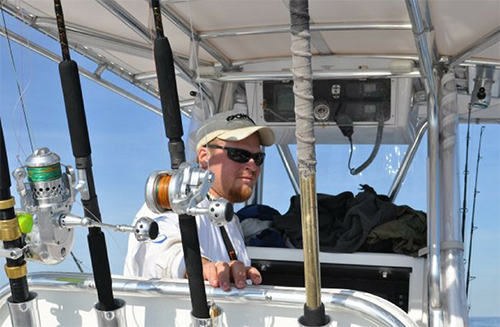 Fishing for black drum has become more and more popular over the past couple of years. These fish put up a great fight, you target them very similar to redfish, and they can deliver quite the table fare, as well. 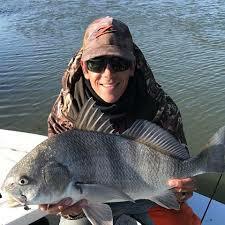 Black drum can be found around oyster beds, rock piles, flats and even around docks. A new and effective trend for targeting redfish is becoming more common, and it focuses on structure. Structure holds shrimp, blue crabs, and other crustaceans that black drum love to feed on. One of the most important factors involved with targeting black drum is using a bait that they commonly feed on. Shrimp, crab, and clams are common baits used when fishing for black drum. When I am fishing around docks or rock piles for black drum, I like to use a little weight as possible – just enough to hold the bait on the bottom. Most often, I am fishing with a Carolina rig with a ⅜ to a ½ ounce egg sinker. Once you pitch the bait around the structure, it is time to play the waiting game. One tip for targeting these guys it to keep your hand on the line. Black drum will often feed very slowly on the bait until they have eaten it all the way to the hook. I do not typically recommend setting the hook when fishing for black drum, instead I like for the fish to swim away with the bait. Once he is hooked, it’s time to start pulling. Black drum will usually dive right back into the structure, or to the deepest area they can find. When fishing around any type of structure, I recommend using 20-30 lb braid, which gives great sensitivity, as well as excellent snatching power. Using too heavy of line can result in the loss of a lot of sensitivity, and you might miss fish because of the heavy line. Whether fishing around docks rocks or oysters for black drum there are three key things to remember: use the right bait (I’ve found shrimp live or dead work the best), use light weights on your rigs, and let the fish eat (don’t set the hook the first time you feel a bite). These tips are guaranteed to help you have a higher success rate when fishing around structure for black drum.